The political philosophy of John Locke greatly influenced our Founding Fathers. This is evident by the long passages of Second Treatise of Government which were reproduced word for word in the Declaration of Independence. Locke’s ideas go on to influence the drafting of The Constitution of the United States of America, the oldest constitution that is still in use today. Amended into that document in 1791 was the Bill of Rights, which ensures us basic liberties. Most of us are familiar with these rights which include, freedom of speech, freedom of religion, the right to keep and bear arms, the right to due process, and others (The Constitution). However, some citizens question the logic of the 2nd Amendment, who’s text is reproduced below. The goal of this post is to make the logic of John Locke and our Founding Fathers clear regarding the inclusion of the 2nd Amendment into our Bill of Rights. The arguments in opposition of our 2nd Amendment Rights are based on the false notion that by living in a politic society with a common judge we have no need for weapons. In order for us to warrant nullifying the 2nd Amendment, we would have to show that there exist no cases in which a firearm or weapon could be used in a civil society. 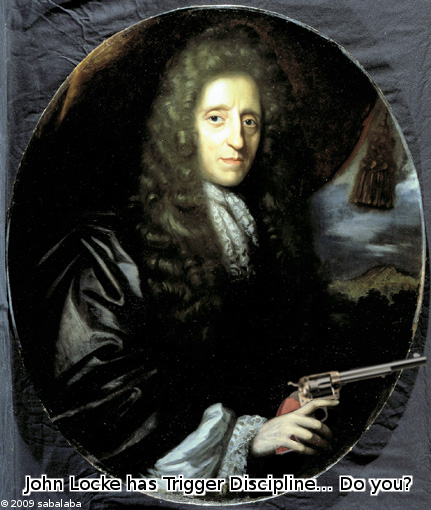 I will attempt to counter this reasoning by demonstrating that the philosophy of John Locke—one of the political and philosophical cornerstones that our nation was founded upon—has provisions in which the use of force, and thus, the use of weapons, would be permitted even in a modern civil society such as America. First let us make clear Locke’s philosophies, beginning with the state of nature. In short, humans existed in “a state of perfect freedom to order their actions, and dispose of their possessions and persons as they think fit, within the bounds of the law of nature” (Locke §4). This state is governed by one law, “no one ought to harm another in his life, health, liberty, or possessions” (Locke §6), this is the law of nature. Locke provides yet another state, called the state of war which is “a state of enmity and destruction…[arising from] designs upon another man’s life” (Locke §16). When we are put into a state of war, we have the right to take the life of that individual who has initiated this state of war and whom “has exposed his life to the other’s power to be taken away from him, or any one that joins with him in his defense” (Locke §16). As Americans, we have left this state of nature, for “want of a common judge with authority” (Locke §19). This is where some Americans become confused with regards to the philosophy of Locke. ust because we have left this state of nature and relinquished our executive rights to a common judge does not mean that we need to relinquish our weapons as well. There are many cases in which there is neither the time, nor the option to seek remedy from a common judge. A mugging for example. By using force, a mugger attempting to acquire your property is not only threatening to take that property, but, we can deduce, also threatening your life. For, if he is so willing to use unlawful force to acquire material goods, if he were to have you fully under his power, what would stop him from taking your life? The mugger merely poses the question, “your money or your life”. The mugger has not given you a choice, you “could not have time to appeal to the law to secure [your life], and when it was gone it was too late to appeal. The law could not restore life to [your] dead carcass. The loss was irreparable; which to prevent the law of Nature gave [you] a right to destroy him who had put himself into a state of war with [you] and threatened [your] destruction” (Locke §207). Locke’s philosophy holds true and we are given the right to defend ourselves, even if that means taking the life of the mugger. The mugger’s use of “force without right upon a [your] person makes a state of war both where there is, and is not, a common judge” (Locke §19). “Where there is, and is not, a common judge”, this shows that Locke’s philosophy holds even after we have chosen to leave the state of nature by seeking a common judge with authority. Thus, Locke’s philosophies do allow for the use of force by the citizenry to defend themselves in situations in which there is no option of an appeal to a common judge. Next time you are posed with the question, “your money or your life”, choose both. Our 2nd amendment rights allow us to deal with those noxious animals—with fisticuff or firearm—who seek to impose their will upon us using unlawful force. The Constitution of the United States (1787). Locke, John. Second Treatise of Government. 1680. Print.